McCance studied at Glasgow School of Art and was awarded a Travelling Scholarship. After a spell in London where he produced some of his most adventurous and successful drawings and paintings in the Vorticist and Cubist style, he moved to Montgomeryshire where he became controller of the Gregnog Press, designing and illustrating high quality limited edition books. During the 1930s, he lived in the Midlands and Berkshire, producing terracotta and fireclay sculptures that were closely related to his drawings. He later became Lecturer in Typography and Book Production at Reading University School of Art in 1943, a post he held for 14 years. He visited the Lascaux caves in France soon after the war, and this inspired a series of rather sombre wax resist watercolours and lino cuts. About this time he also developed a monotype technique for a series of overlay drawings in printers inks. 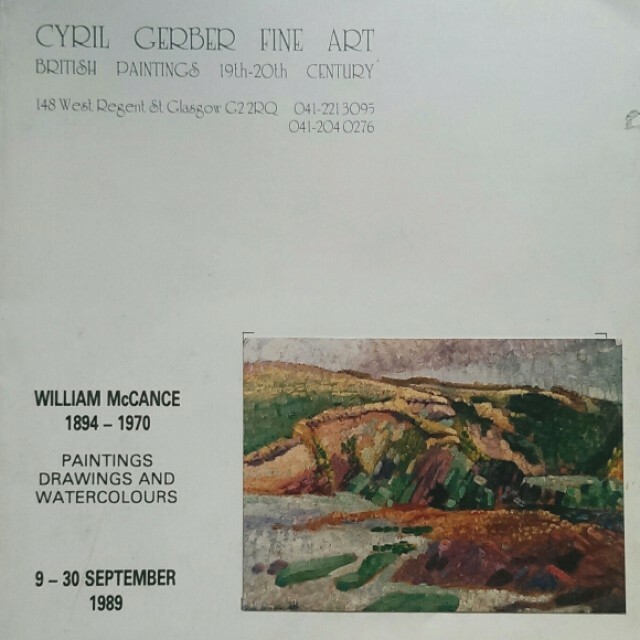 McCance returned to Scotland in 1960, where he settled in Girvan, and continued to work in the various media that interested him until his death in 1970. This exhibition features a number of his paintings, drawings and watercolours.